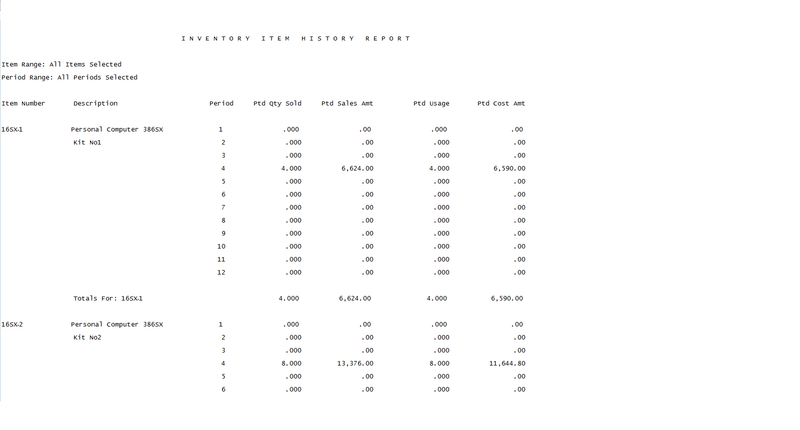 The Item History Report generates a report to help in analyzing your sales, usage, and quantity sold of your inventory by period. 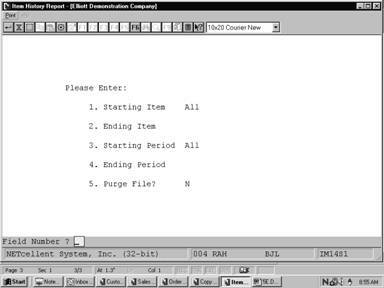 It provides up to 24 periods of historical data for analysis. This report is commonly used to isolate usage resulting from non-sales transactions, and periods of high sales and/or usage. It enables you to track important business variables such as the periodic usage of an item, the variances in quantity sold, the total sale and cost amount of an item. Enter the starting item number of the range you wish to print. Enter the ending item number of the above range. Defaults to starting item number. Enter the starting inventory period of the range. Defaults to All. Enter the ending inventory period of the range. Defaults to starting period.